While they are commonly called cardboard boxes, most shipping cartons are made of corrugated fiberboard material. A piece of corrugate consists of multiple layers. A central layer of fluted (rippled) paperboard material is sandwiched between two layers of flat linerboard. Corrugated boxes can be single-walled (with one layer of fluting and two layers of linerboard), double-walled (two layers of fluting and three layers of linerboard) or even triple-walled (three layers of fluting with four layers of linerboard). You can think of them like single, double or triple hamburgers, with layers of meat (fluting) in between layers of bun (linerboard). Corrugated strength is rated using one of two rating systems: the Mullen Burst Test or the Edge Crush Test (ECT). To learn the difference between them, read our blog "Understanding Corrugated Material Strength Ratings: Burst Strength vs. Edge Crush Testing." It is important to choose the right box strength for the products they will contain and the stresses the box will endure during shipping and handling. A box that is too weak may be crushed under the weight of other packages or burst at the seams or sidewalls, resulting in loss or damage to its contents. On the other hand, selecting a stronger box than is needed is a waste of money and materials. Maximum recommended weights depend on rating of the corrugated material (see chart below). This is the maximum weight of the final carton, including contents, box and any void fill materials. There are also maximum recommended carton sizes for the different types of corrugated materials. 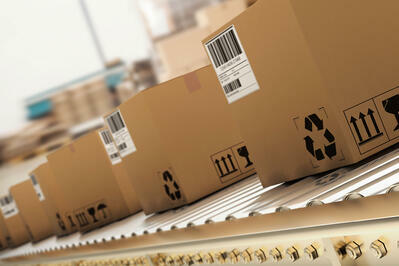 The most commonly used corrugated shipping box material today is 32 ECT. These standard single-wall corrugated boxes are versatile, economical and appropriate for most light- or medium-weight products. For heavier items such as larger boxes of books or tiles, you will want to select a stronger material, either a heavier-weight single wall with a higher ECT or Mullen Test rating or a double- or triple-wall corrugated box. While charts typically show that a 32 ECT box is equivalent to a 200# Burst Test (Mullen Test) box, the 200# corrugated material is actually heavier and stronger than the 32 ECT. They both are rated for the same maximum carton weight, but the 200# material will provide better protection against punctures or rough handling on the road. Pantero stocks single-wall 32 ECT boxes, single-wall 200# Mullen Test boxes, and double-wall 275# Mullen Test boxes. These box weights can accommodate the vast majority of shipping needs. If you need something out of the ordinary, let us know and we can help you source it. *200# Mullen Test box provides greater puncture resistance and burst strength than 32 ECT equivalent. Need help selecting the right box? Contact us to talk to one of our packaging experts.